Habit: Shrub, branches straggling. Stem: bark finely shredding. Leaf: alternate, often crowded toward branch tips, deciduous, papery, elliptic, flat-brown-hairy on midrib abaxially, margin rolled under in bud. Inflorescence: terminal, umbel-like; pedicel spreading-downcurved, bud scales light brown, early-deciduous. Flower: +- bilateral, sepals 4, fused 3/4; petals 4, fused; stamens 5[8,10], anthers dehiscing by short slits, unawned; ovary superior, chambers 4, placentas axile. Fruit: capsule, septicidal, dehiscing tip to base. Seed: many, small, fusiform. Habit: Herbage glabrous to flat-brown-hairy and/or glandular-hairy. Stem: sprawling to erect, 1--4 m. Leaf: 1.5--4 cm, tip mucronate, margins glandular-ciliate. Inflorescence: terminal on last years shoots, occasionally appearing axillary; pedicel straightening in fruit. Flower: corolla 6--7(13) mm, urn-shaped to +- spheric, +- yellow to orange-bronze, lobes short. Fruit: < 8 mm wide, valves 4. Seed: many, elongate, often with short tails, coat loose. 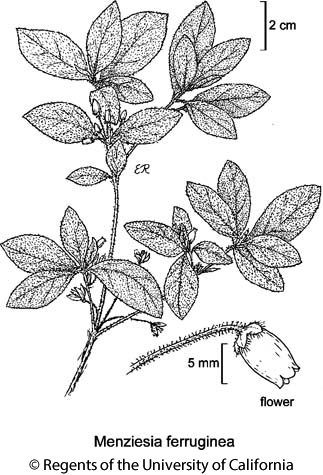 Citation for this treatment: Kathleen A. Kron 2012, Menziesia ferruginea, in Jepson Flora Project (eds.) Jepson eFlora, http://ucjeps.berkeley.edu/eflora/eflora_display.php?tid=33296, accessed on April 22, 2019.